Winged Guardian cannot have restricted attachments.Forced: After an attack in which Winged Guardian defends resolves, pay 1 Tactics resource or discard Winged Guardian from play. Attach to a hero. Attached hero gains +1 Attack. Action: Pay 1 resource from attached hero's pool to attach Dunedain Mark to another hero. Action: Each player draws 1 card. Action: Discard Westfold Horse-Breaker to choose and ready a hero. 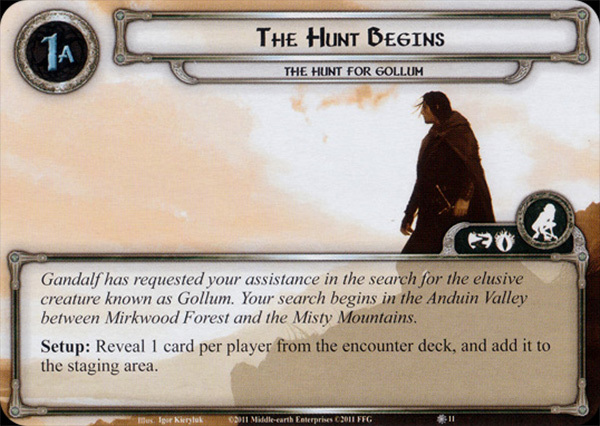 Response: After you play Rivendell Minstrel from your hand, search your deck for 1 Song card and add it to your hand. Shuffle your deck. Attach to a hero. Attached hero gains a Leadership resource icon. Response: After a location is revealed from the encounter deck, immediately travel to that location without resolving its Travel effect. If another location is currently active, return it to the staging area. Action: Search the top 10 cards of your deck for any 1 Rohan ally card and add it to your hand. Then, shuffle the other cards back into your deck. 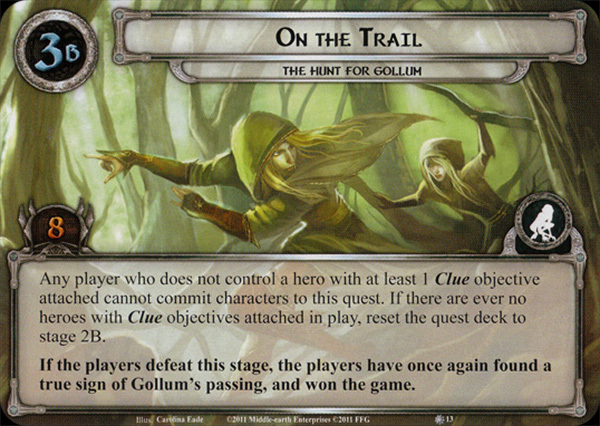 When Revealed: The first player chooses and shuffles a card with the printed Clue trait back into the encounter deck. If there are no Clue cards in play, False Lead gains surge. When Revealed: Remove all progress tokens from all Riverland locations. Shadow: Resolve the 'when revealed' effect of this card. When Revealed: Discard the top card of each player's deck. 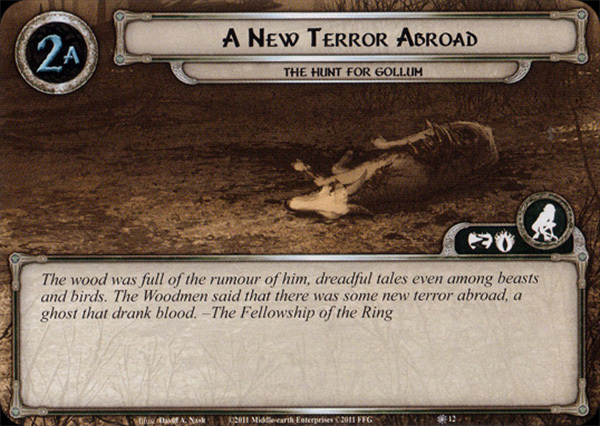 Until the end of the phase, increase Goblintown Scavenger's Threat by the total printed cost of all cards discarded in this way. 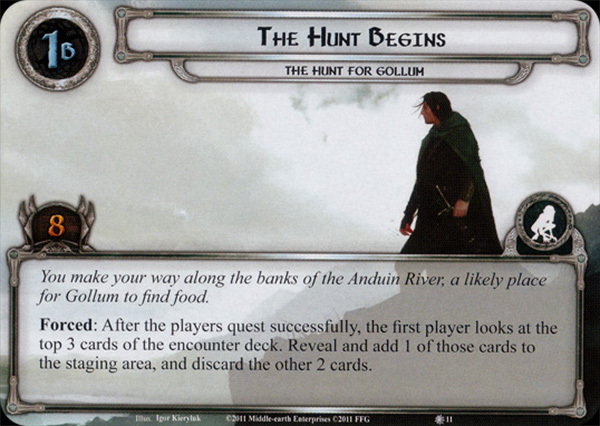 Hunters from Mordor get +2 Attack and +2 Threat for each Clue card in play. When Revealed: Discard 1 resource from each hero's resource pool, if able. Exhaust any hero that could not discard a resource from its pool. 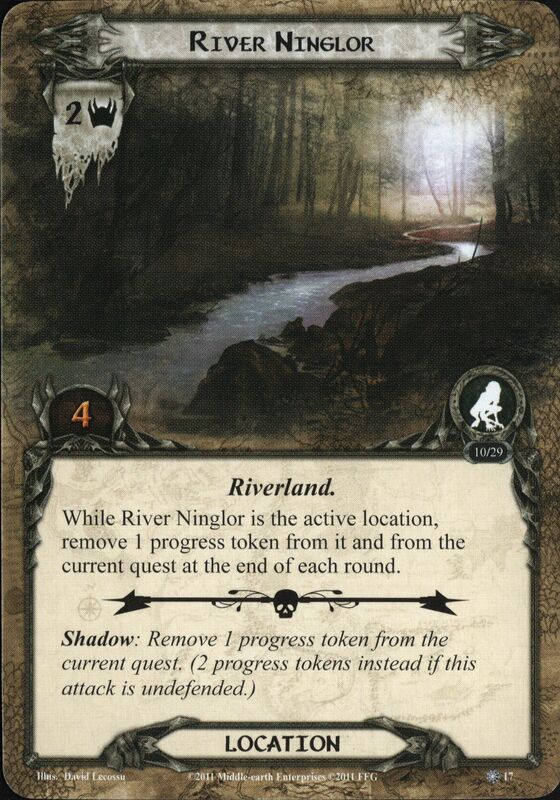 While River Ninglor is the active location, remove 1 progress token from it and from the current quest at the end of each round. While The East Bank is the active location, ally cards cost 1 additional matching resource to play from hand. Shadow: If you do not control at least 1 hero with a Clue card attached, return this enemy to the staging area after its attack resolves. 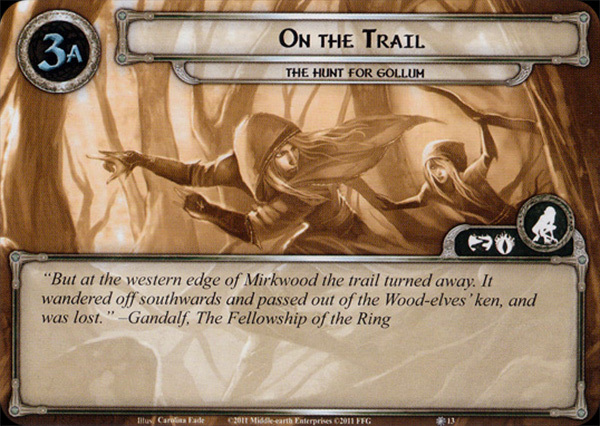 While The Eaves of Mirkwood is the active location, encounter card effects cannot be canceled. X is the number of ally cards in play. Shadow: Discard from play all allies with a printed cost lower than the number of Riverland locations in play. While The West Bank is the active location, attachment and event cards cost 1 additional matching resource to play from hand. Shadow: If you do not control at least 1 hero with a Clue card attached, double this enemy's base Attack for this attack. Setup: Reveal 1 card per player from the encounter deck, and add it to the staging area. Forced: After the players quest successfully, the first player looks at the top 3 card fo the encounter deck. Reveal and add 1 of those cards to the staging area, and discard the other 2 cards. Forced: At the beginning of the quest phase, the first player looks at the top 2 cards of the encounter deck. Reveal and add 1 of those cards to the staging area, and discard the other. Any player who does not control a hero with at least 1 Clue objective attached cannot commit characters to this quest. If there are ever no heroes with Clue objectives attached in play, reset the quest deck to stage 2B. If the players defeat this stage, the players have once again found a true sign of Gollum's passing, and have won the game.